Quesnel Lake, with its pristine waters and abundance of big fish, is one of the most popular lakes in British Columbia and one of the most unique in all of Canada. It may also be one of the best-kept fishing secrets in North America due, in part, to its remote location. Forged by glaciers and with a maximum depth of 610 meters (2000 feet), it is the deepest lake in British Columbia, though not the deepest in Canada – Great Slave Lake in the Northwest Territories holds that distinction. However, Quesnel Lake is considered to be the deepest freshwater fjord lake in the world. This beautiful wilderness lake situated against the backdrop of the snow-capped Cariboo Mountains offers both scenery and fishing that are unparalleled in Canada, or anywhere else for that matter. For the fishing enthusiast, in particular, the fly fisherman, Quesnel Lake with its numerous tributaries such as Horsefly River and Niagara River is something special. It is one of only a handful of places in the world that can boast of trophy Rainbow Trout in the 20-pound class and monster Lake Char (Lake Trout) in the 30 – 40 pound range. The fish here have certainly benefited from the incredibly nutrient-rich waters and the location’s remoteness. Other species caught on the lake include Kokanee Salmon, Bull Trout, and Dolly Varden. Fly Fishing the mouth of its rivers and creeks can also be fantastic for other popular species such as Sockeye and Chinook Salmon. Though fly fishing remains popular in the region, conventional fishing and even trolling are also suitable on Quesnel Lake. 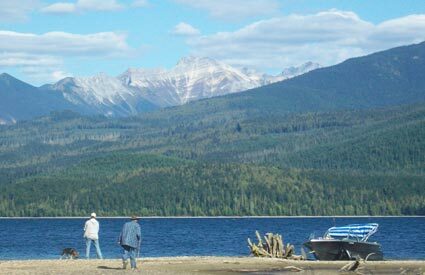 For those of you wanting to fish this incredible location, booking a Quesnel Lake Fishing Charter/guide is quite possibly the best option. A Quesnel Lake fishing charter or guide not only provides the boat, but also all of the angling equipment and knowledge you’ll need to catch any of these amazing local area fish. In addition to fishing guides on the lake, there are several fishing lodges and resorts offering all-inclusive fishing packages at excellent rates. For many visiting the area for the first time, this may be the way to go. In most cases, all of your meals and accommodations, along with fully guided fishing trips and all the tackle you will need, are included. Some of the lodges even offer an airport shuttle and special group rates. The fishing is great on Quesnel Lake but there is plenty more to do here. Quesnel Lake is about a mile and a half wide and 2.5 miles long, so there’s plenty of space here to explore. You’ll witness natural beauty all around – breath-taking, panoramic views of this remote wilderness retreat with its mountain peaks and beautiful Cedar tree lines. There are also designated campgrounds and sandy beach areas for walks. You can rent a canoe or kayak for those who want to explore the lake at their leisure. Perhaps watch an eagle take flight or maybe if you’re lucky enough to be here in autumn, take in the spectacular sights of spawning Sockeye Salmon or the rich colors that surround the lake. Thinking about fishing this great location? Fill out the form on this page!